Finding the perfect gift can be tough — especially when you have to find one for your significant other, your best friend, your mom and your dog. Luckily, Etsy exists and is coming to the rescue again! It’s the best — and easiest — place to find one of a kind, handmade items that will make this gift giving season stand out. To make your shopping experience even easier, we compiled a list of our favorite Omaha area Etsy stores. Support local and handmade this year by shopping these creators from just around the corner. Grab a gift for your husband, your wife, your kids, your cat and even your home. Happy shopping! 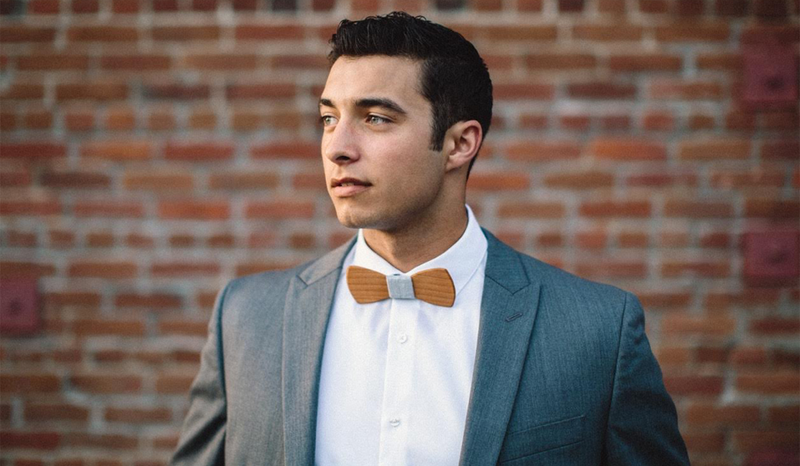 Photo courtesy of Nebraska Wood Apparel Co.
Brandon and Derrick Workman of Nebraska Wood Apparel create cufflinks, tie clips, money clips and bowties entirely out of wood. In a variety of shapes, styles and patterns, they’re the perfect gift for the hip man in your life. 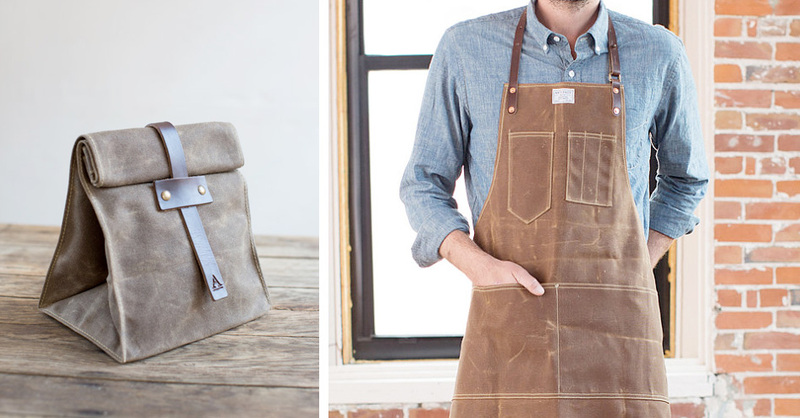 Artifact has been creating handmade briefcases, totes, backpacks, and aprons since 2010 right here in Omaha. Their backpacks and leather wallets have a rustic charm any man will love! You can even get him a leather lunch tote so he’s always well fed. Pierre Bolouvi sells his original sports-inspired art out of Omaha. And if you don’t see your man’s favorite team, he’ll create something brand new. For the Omaha fanatic in your life, you can even get a pencil drawing of the more popular places in the city (like this one and this one). BareKnuckle makes handmade leather utility goods. Wallets, card holders, tool and wrench rolls, notebook covers — they have it all. Both stylish and functional, these make perfect gifts for the man in your life! Right in Bellevue, Alethea in Stitches hand makes fabric bins, baskets, bags, sunglass cases and makeup cases. In a wide variety of styles and patterns, there’s something for everyone — even the kids! And her adorable purses would be a great addition to any wardrobe. Alongside gorgeous table runners and woven wall hangings, East Parlor sells some of the coziest scarves. The soft colors are perfect for the fall and winter months. This is a gift that will quickly become a wardrobe staple for the woman in your life! Sam Taylor hand makes every piece of jewelry in her shop. Indigo Lunch is a line that focuses on making unique, eclectic and affordable pieces; Sam’s full product line can be seen on her website. Her Etsy shop is filled with one-of-a-kind earrings, necklaces, bracelets and even keychains that are sure to make every woman happy! Bomb De Fleur offers a line of jewelry inspired by nature and vintage finds. The pieces often feature real moss, vintage stamps and even real sunflower. This is the perfect place to shop for the bohemian lover in your life! Old Wool New turns old sweaters into some of the warmest and cutest mittens on the market. Owner Kim Vennerstrom uses both wool and cashmere for her designs and also offers headbands and fingerless gloves. Give the gift of warmth this holiday season! Courtney Mattern learned calligraphy from YouTube tutorials and books in preparation for her wedding. Since then, she has gone on to design adorable mugs, prints, notebooks and cards — each hand drawn by her when you order. We love her charming artwork and especially her Nebraska-themed cards! Mallow World designs each card set, poster and calendar by hand and offers them as print-outs so you can instantly get an adorable game or decor item for your child. Both educational and stylish you can download alphabet posters, flashcards and even a zoo passport — perfect for a trip to the Omaha Zoo! Sara Rubin at The Printed Pig creates charming t-shirts and pillows perfect for kids and for your sassiest friends. You can easily spread cheer and add pops of neon to any bedroom at the same time! The cutest onesie award certainly goes to A Bentz Boutique! Allison Bentz crochets newborn outfits, baby slippers, headbands and other baby necessities perfect for upcoming holiday photos. And we love the fox outfit — complete with ears and a tail! Increase your baby’s glamor and style with a handmade bib from Pistachio Co. Ultra soft material keeps the baby happy and ultra chic patterns keep mama happy. While you’re shopping, grab a matching burping cloth and changing pad! Jenna Marie designs delightful cartoon stickers. With over 150 different dog breeds, more than 60 types of cats as well as seasonal and sports-themed options, the kids (and you!) will be playing with stickers for weeks! These handmade moccasins and booties are a must for every baby’s feet this holiday. You’ll keep them warm and stylish at the same time! Get a festive pair for Christmas Day and a pattern they can wear all year! Fill your cat’s stocking with handmade toys, blankets and kickers this holiday. At SJJdesigns, you can get them classic mice and fish as well as chili peppers, fleece deer tails and even kiwi slices! Santa isn’t the only one who needs cookies this holiday season. Two Tails Dog Bakery out of Omaha produces meticulously made gourmet dog cookies with human-grade ingredients. Order by December 5 to get cookies for Christmas! Your pet may not appreciate an art print as much as you do, but these breed-specific images are a great way to celebrate your furry friend. You can even get a custom silhouette of your dog! And 10% of proceeds go to a different no-kill animal shelter each quarter. October – December, your purchases will help Little White Dog Rescue in Omaha. Samantha, owner of Designer Pillow Shop, went to the University of Nebraska where she studied Textile and Apparel Design. Now, she’s doing what she loves right here in Lincoln. Not only can you find the perfect pillow to spice up any room, you can get curtains, sheets and baby items as well! Photos courtesy of The Anastasia Co. The Anastasia Co. has the perfect prints and posters to display your style and character. Need to show off your love of coffee in the kitchen? Or add a hip ampersand to your living room? The Anastasia Co. has a little something for everyone. Not only does The Howdy Owl create beautiful carved wood maps, they can customize any of them! Add your family name, an inspiring quote or design something brand new! With multiple designs and color palette options, you can add a rustic map to several rooms in your home! We love Rachel’s cross-stitch portraits! Get your whole family pictured on a charming cross-stitch display — even include the pets. These would be great gifts for your own home and for all your friends and family. Spread the cheer (and a little sunshine) this holiday. Becki, owner and creator behind HLB Home Designs, has been featured by Elle Decor and House Beautiful for her bright, modern pillow, curtain and art designs. You can get full pillow sets to tie a space together or a single pop of color to add a statement to any room! Which Etsy shops did you fall in love with? Share your new home design and gift ideas with us and help spread the holiday spirit this season. If we missed your favorite local Etsy store, let us know!